A friend of mine recently traveled to Washington, D.C. for a wedding. Of course the first thing I thought was, "I wonder if she'll visit Georgetown Cupcake?" 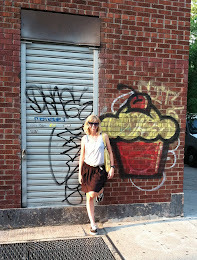 Then I had to remember that not everyone is as obsessed about cupcakes as I am. 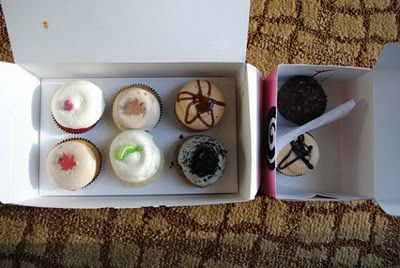 But when she tweeted that she was getting cupcakes, I just knew that's where she was headed. You may recognize Georgetown Cupcake from the TLC network's summer show "DC Cupcakes." 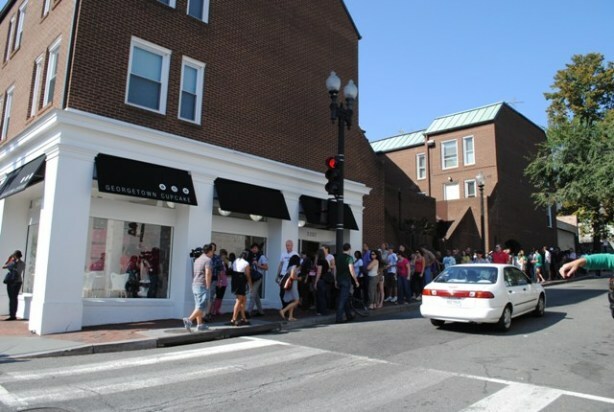 Georgetown Cupcake opened in 2008 and sells 5,000 cupcakes a day. With that many cupcakes being sold, you know it has to be good, right? While Tran was waiting in line for her cupcakes (a 40-minute wait! ), they were filming for (I'm assuming) season 2 of DC Cupcakes. I guess the show was a hit! 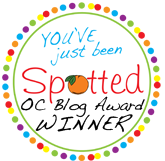 "I had low expectations for the cupcakes because I didn’t want to be disappointed if they didn’t live up to the hype. But.. I was very surprised at how DELICIOUS they were. The cake was moist and the frosting wasn’t overly sweet. Some flavor combinations were better than others, but all of them were good. What was really amazing about them was how they held up after traveling around DC (waiting for the DC Circulator in Georgetown, catching the Metro at Dupont Circle) and staying in the room overnight (near the A/C unit) and during the day (while we got ready for the wedding). I ate them more than 24 hours later without any refrigeration, and they still tasted amazing and had this perfect texture (cake and frosting both)." "Peanut Butter Fudge: Valrhona chocolate cupcake with a fudge core topped with a peanut butter frosting and fudge star drizzle. The cake was delicious, and it had this AMAZING fudge core that just oozed chocolaty goodness. The frosting left much to be desired.. it general tasted liked whipped up Creamy Jiffy.. so I was not impressed with that. Key Lime: Fresh key lime cupcake with key lime frosting topped with a candied key lime. Tasted like the best key lime pie I have ever had, but in the perfect cupcake size. Salted Caramel: Caramel cupcake with a salted caramel-infused buttercream frosting topped with a caramel drizzle. I’m a huge fan of salted caramel ANYTHING. This cupcake was no exception. What would have made this cupcake even more perfect is if there was a salted caramel core. Maple: Maple cupcake with a maple-infused cream cheese frosting topped with a fondant maple leaf. The maple cupcake wasn’t anything special (in terms of flavor). But it was good. If I just wanted a simple cupcake without anything too rich or fancy, this would be it. Chocolate ³: Valrhona chocolate cupcake with a rich Callebaut chocolate ganache icing topped with french chocolate sprinkles. I think this one was my favorite. Like most girls, I LOVE LOVE LOVE chocolate.. and this cupcake did not disappoint. It was that perfect balance of rich chocolate flavor and light sweetness. The texture of the cake was moist and the ganache icing was the perfect way to top this. Red Velvet: Classic red velvet cupcake with a vanilla cream cheese frosting topped with a red fondant heart. I’m not usually a fan of red velvet, but this one was really good. In fact...Minh actually finished off the cake part (he didn’t care too much for the frosting) after I took my bite. Mint Cookies and Cream: Madagascar bourbon vanilla cupcake baked with oreo crumbles topped with a mint oreo crumble-infused buttercream frosting. I didn’t get to try this one, but it looked (and sounds) delicious. Will need to try it whenever I head back to DC. Generally speaking, I was very impressed with Georgetown Cupcake. It was well worth the long line (only 40 minutes) we waited in outside. And for those of you not willing to wait in line, there’s another location in Bethesda, MD." Tran's review really makes me want to visit Georgetown Cupcake. 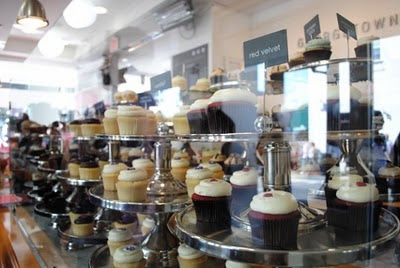 With all of the sites to see in Washington, D.C., Georgetown Cupcake is the one I'm dreaming about. I hope to get there someday! P.S. You can also order their cupcakes online. If anyone ever wants to send me cupcakes....just saying! P.P.S. You can read Tran's full review here. Thanks Tran! 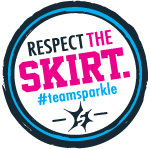 Labels: DC Cupcakes, Georgetown Cupcakes, guest review, TLC, Washington D.C.